"Heaven isn't too far away. 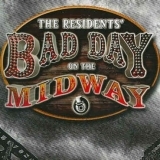 Closer to it every day"
Bad Day On The Midway (Music From The Game Reconsidered) (this album) (2012). Sorry, no matches on eBay for "Bad Day Re Emerges The Residents".